For thousands of years, native people enjoyed the scenic juncture where the Rock and Kishwaukee rivers meet. Step inside the stately manor atop its bluffs, and see why wealthy Chicagoans Charles and Esta Barrett’s gentleman’s farm and has much to teach us about ourselves. The term “country gentleman farmer” isn’t used much today. What do you picture when you hear it? Finely dressed aristocrats throwing lavish parties on lush lawns? That image wouldn’t be wrong, but it would be incomplete. There’s more to know about these “hobby farms” that once dotted our landscape. While it’s true they were typically owned by wealthy Chicagoans who sought an escape from the hot and dirty city, they also helped to advance U.S. farming practices. Then came the Stock Market Crash of 1929. Located at 6901 Kishwaukee Road, Rockford, high above the confluence of the Kishwaukee and Rock rivers, Indian Hill Manor & Farm Historic District is listed on the National Register of Historic Places. Rich in early 1900s history, it includes a manor house, coach house, dairy farm and 50-acre Indian Hill Forest Preserve, the latter managed by Forest Preserves of Winnebago County. The handsome Colonial Revival-style brick manor house was designed by renowned architect Charles W. Bradley of Rockford, whose firm was founded in 1854 and still exists today as Bradley & Bradley Architects. The solidly built manor has seven bedrooms, seven bathrooms, six fireplaces and oodles of charm. “One of my favorite rooms is the large screened-in porch with original wicker furniture,” says Bonnie. That porch overlooks a formal sunken garden designed by O.C. Simonds, a famous landscaper who helped to design Morton Arboretum and Chicago’s Lincoln Park, as well as many parks and estates along the Rock River. In some ways, the sunken garden is a smaller version of Rockford’s 1909 Sinnissippi Rose Garden, with its graceful fountain, white-painted pergola, sundial and trellises. The first lady of the original estate, Esta Reed, filled the garden with roses, irises, peonies and other perennials. “The landscape design of Indian Hill Manor integrated the buildings into the natural surroundings, enhanced the views of the river and forest, and emphasized the use of native trees and shrubs instead of the showy flowers and exotic plants that were popular in formal Victorian gardens at the turn of the century,” explains Jerry Paulson, a consultant to the Smeja Family Foundation. Paulson retired as executive director of the Natural Land Institute in 2013 and has spent the past few years researching the natural and cultural history of Indian Hill Manor and its surroundings. The manor was completed at the end of World War I, a time when many Americans were keenly aware of the toll that settlement had taken on the landscape and wildlife – and on the native people who had lived here for thousands of years. Conservation efforts were afoot; the Illinois state park system was established in 1909, the national park system in 1916. In 1917, Rockford was in its heyday as a premier U.S. city.Camp Grant opened as one of the largest Army training facilities in the nation, just a short jaunt from Indian Hill Manor. As things turned out, a woman was at the helm of Indian Hill Manor & Farm for the first three decades of its existence. The Smeja family is working to piece together a more complete history of Indian Hill Manor and its surrounding area, but many mysteries remain. They welcome input from those who may have relevant photos, artifacts or memories of the property and its founding family. Already, many anecdotes, original furnishings and other objects have found their way back to the estate. Indian Hill Manor was built with Chicago money. Businessman Charles C. Barrett, president of DeVoe and Raynolds Paint Co., lived at a posh address on Astor Street and ran with the Gold Coast crowd after the turn of the century. He married a talented singer/actress named Esta Reed, originally from southern Indiana, who had performed throughout Europe. She was divorced and had a son named Harry Reed. Charles was 59 and Esta was 46 when they married in 1914. They immediately searched for a rural location on which to build a country estate and found it at the confluence of the Kishwaukee and Rock rivers. They registered the site as “Indian Hill Farm” in 1915 and hired a renowned Rockford architect to design their new home. Tragically, Charles had lived in his beautiful new country home for only a few months, in 1918, when he died from Spanish flu. Ravaging soldiers in crowded World War I foxholes, the pandemic had spread across the globe with moving troops, killing 675,000 Americans, including more than 1,000 at Camp Grant in September 1918 alone. After her husband’s death, Esta Reed made Indian Hill Manor her permanent home. “She was part farm girl, part socialite,” says Bonnie. “She not only enjoyed gardening but also bred Guernsey cows, entering them in competitions. There were a lot of women farmers in this area who enjoyed competing with one another.” Among them were women in the family of Ralph Emerson, a Rockford industrialist whose family farm was across the street from Indian Hill. Perhaps because she understood the challenge of being a single mother – this is only conjecture – Esta Reed co-founded Rockford Day Nursery, one of the first social service agencies to provide child day care in Rockford, says Paulson. She hosted lavish events in her sunken garden to raise money for various charities and managed Indian Hill until 1947, when she died in an auto accident in Florida at age 79. Esta’s son, Harry Reed, with wife Lillian, managed the estate until his death in 1969. The Reeds’ only child and heir, Charles “Chuck” B. Reed, a World War II veteran, Boy Scout troop leader and firearm safety instructor, devoted himself to conservation. He was far less interested in the manor house than in the beautiful property surrounding it. He hosted camps and Scout jamborees in the woods and on the large lawns. Because Chuck Reed wanted the property to become a model farm for soil and wildlife conservation, he donated 50 acres of the farm to the Natural Land Institute (NLI) in 1989; The NLI later gave that land to the Forest Preserve District of Winnebago County to manage, and it became Indian Hill Forest Preserve. It was Chuck Reed who sold the manor, coach house and 60 acres to Bill and Lucile Smeja in 1971. Most of the rooms had remained unchanged since his grandmother Esta’s death in 1947. 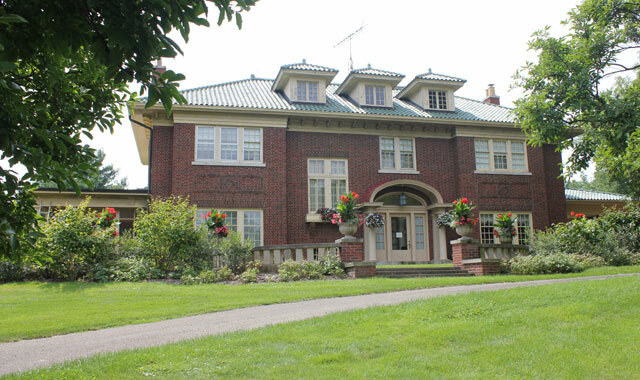 Many original features of the century-old manor house still exist, adding to its historic significance. For example, everything in the kitchen is original except the countertops. As she leads a tour, Jill Smeja opens the door of an original icebox to show how ice deliverymen accessed and filled it from outdoors. The 1920s electric stove still functions (shown left) and there’s a dedicated grease pit outside a special dishwashing room off the kitchen. Other original modern conveniences in the 1918 home include a central hot water heating system, central vacuum, commercial-grade gas clothing dryers, an intercom system and a tin-lined laundry chute. Gas light fixtures were built in anticipation of electrical conversion. The home’s original boiler still exists, although a more efficient heating system with central air later replaced it. As she climbs to the wide second-floor landing of the home, Jill raps on a wall to demonstrate how solid it sounds. Underfoot, 2-by-8-inch oak planks are laid on their sides, rather than wide-side-up, resulting in a floor that’s 8 inches deep, its underside lined with concrete. And why not? The Great Chicago Fire had occurred less than 50 years earlier and country gentleman farmers could afford the most fireproof construction available. Since their mother Lucile’s death in 2007, the five surviving children of the late Bill and Lucile Smeja have worked hard to form a foundation, list Indian Hill on the National Register of Historic Places, acquire property that was once part of the original estate, form local partnerships, and restore significant structures, starting with the historically important James Way dairy barn. “We were all grown by the time our parents bought Indian Hill Manor in 1971, but we spent time here with them and appreciated the uniqueness of the property,” explains Bonnie Smeja. Bill died in 1997, Lucile 10 years later. Bill’s career began with ownership of one gas station. After World War II, he sold cars and ran a well-drilling business during the housing boom. In time, he and Lucile learned how to develop real estate together. Do you have knowledge, photos or artifacts to contribute to the Indian Hill Manor & Farm Historic District? If so, please call the Smeja Family Foundation at (815) 964-6464. If you ask Jerry Paulson about the history of Indian Hill Manor, he just might begin the story 30,000 years ago, when a glacier changed the southward path of the Rock and Kishwaukee rivers and reversed the course of Kilbuck Creek. “Most of what people have experienced here, over the centuries, traces back to the geology,” he says. The end result of glacial activity is a scenic stretch where two rivers converge. Handsome limestone bluffs rise some 170 feet above the riverbanks and many outcroppings of exposed bedrock dot the area. Indian Hill Manor sits atop an island of bedrock the rivers left behind when they cut new southwesterly channels. The topography of this historic district varies from sand dunes and flat glacial terraces to wetland expanses that likely delayed the development of roads and farms. The swampy areas encouraged mosquitos to breed, causing many settlers to perish from a malaria-like fever they called “ague.” This malady is blamed for at least one of the false starts of the non-existent town of Kishwaukee, since its chief promoter, George Lee, died young from the fever. From a settler’s perspective, anyone living on top of the bedrock had to drill down through 250 feet of rock to reach the water table for a well. Such drills simply didn’t exist in the 1800s, one more obstacle faced by those who had hoped to settle Kishwaukee in what’s now the Indian Hill Manor vicinity. In all, four attempts at settling the town of Kishwaukee failed. “It’s one of the highest points in Winnebago County and was an excellent overlook – a place where native people could clearly see canoes coming down both rivers,” adds Jill Smeja. Among native tribes here were Sauk, Fox, Winnebago, Potawatomi, Chippewa, Ottawa and Menomonee. The first of the Black Hawk War battles played out three miles southwest of Indian Hill Manor on Stillman Creek, followed by the eradication of all native people from Illinois, by the mid-1830s. So complete was their displacement that Illinois, unlike all of its neighbor states, is home to zero reservations. At the heart of Indian Hill Farm is a “James Way” dairy barn that represented all things modern when it was built. The design was developed by Wisconsin native William D. James during the Sanitary Milk Movement. His chief aim was to keep cows healthy and happy by providing plenty of ventilation and using materials like concrete and steel that are easier for farmers to clean. James’ barn also introduced adjustable cow stalls, with a rotating stanchion, in 1903. The president of Kent Manufacturing, in Fort Atkinson, Wis., recognized its potential and invited James to join his firm; sales increased by 30 percent each year thereafter and the company changed its name to the James Manufacturing Company. The term “James Way” came to mean high quality farm equipment, in the vernacular, and other companies copied the innovations. Indian Hill Farm was home to horses, sheep, pigs and chickens. Today, students from the Stillman Valley High School Future Farmers of America (FFA) are often at the farm working with animals, studying soil samples, growing crops and taking part in other agriculture educational activities. Several crops can grow here, despite a lack of the rich, black soil common to our region. Jerry Paulson, consultant to the Smeja Family Foundation, explains, “As the last glacier retreated from the region, torrents of glacier melt water came down the Rock and Kishwaukee river valleys, forming new channels and creating terraces of outwash sand and gravel south and east of Indian Hill Manor. The Smeja Family Foundation brought the farm back into the fold in 2010, purchasing it from a descendant of Indian Hill founders Charles and Esta Barrett. The Smejas have spent years stabilizing and restoring the barns and other buildings, with help from FFA students from Stillman Valley High School. This is a special place that sparks curiosity about many subjects – a jewel with many facets. It adds to our knowledge of local geology, archaeology, architecture, landscaping, farm practices, land conservation, social culture and early settlement patterns. Indian Hill Manor & Farm Historic District is open for docent-led tours on Tuesdays through Oct. 3. The hourlong tours begin at 10 a.m and 1 p.m., with a 10-person maximum and three-person minimum. Pre-registration is required. The cash-only fee is $7 for adults and $5 for seniors over age 62. Register online at indianhillmanor.net/news-events. The manor is also available for light rental use by groups with an interest in gardening, history or conservation. It is not available for private parties, weddings or commercial uses. This entry was posted on Thursday, August 24th, 2017 at 11:59 am	and is filed under Features, Top Posts. You can follow any responses to this entry through the RSS 2.0 feed. Both comments and pings are currently closed.